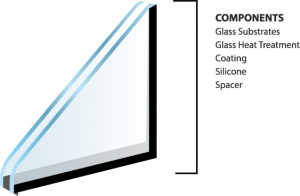 Complete Line Glass insulating glass saves energy in any home or nonresidential building by improving the thermal performance of windows. It creates a more comfortable indoor environment free from extreme temperatures, and can reduce heating and cooling costs significantly. Insulating glass is ideal for buildings that require efficient climate control. Inherently, insulating glass improves a window’s thermal performance by using an air space between two or more lites of glass to reduce the heat gain or loss. The result is windows and doors that are more energy efficient and buildings that are more cost effective. This type of glass can also reduce noise transmission. Our insulating glass units are double sealed, using a primary polyisobutylene seal and a secondary silicone seal. To ensure the sealed space remains dry throughout the unit’s lifetime, the glass lites are separated by a desiccant-filled spacer. The desiccant absorbs any internal moisture in the insulating glass unit. Coatings are thin layers of substrate that are applied to glass in order to improve solar performance. Low-E (Low-Emissivity) coatings are among the most popular coatings applied to glass because of their low heat transfer properties. They also allow greater light transmission than traditional reflective coatings. Complete Line Glass offers a wide variety of Low-E and reflective coatings. Energy codes continue to change, and AGC is evolving to provide architects with products that not only meet current codes, but are positioned to meet the next evolution. Introducing Energy Select from AGC, high performance low-e coated glass designed specifically for the architectural market. With a broad range of options, Energy Select was developed to help Architects meets the regulatory challenges of each project, while maintaining their design vision. As the most famous coated glass in the world, Stopsol is a brand recognized for its stunning aesthetics due to its combination of brilliant coatings and extended range of coloured glass. This range of solar control hard-coated glass delivers good light and energy performances, ensuring the privacy and comfort of people inside the building and reducing air-conditioning costs due to its low solar factor. Available in Clear, Grey, Bronze, and Green. With its high-quality acid-etched satin finish, Matelux strikes the delicate balance between offering privacy while letting in light. Soft to the touch, this translucent glass also comes in a double-sided version, ideal for doors and room dividers. Spandrel is opaque glass that is used to conceal the areas between floors, hiding unsightly structural components and mechanical equipment. When used in conjunction with vision glass, they give the appearance of an “all glass” facade. Available in White, Black, and Grey.